Fertility is a complicated part of being a woman, and acupuncture and herbal medicine are gentle methods that can guide you through the process. Since fertility is an issue that affects both men and women, we also treat men who are experiencing fertility problems. It can be frustrating trying to conceive, only to find out that things are not happening as quickly as you wish. Acupuncture has been known to help enhance fertility by restoring the body to a balanced state. Patients are encouraged to try acupuncture treatments before investing time and money into an in vitro program. In addition, acupuncture can be used as an adjunct treatment to IVF/IUF or other fertility treatments. In fact, recent studies have discovered that acupuncture, when used in conjunction with IVF, can increase a woman’s chance of successfully conceiving and carrying a baby up by 50% than those who didn’t use acupuncture. In our clinic, the successful rate has been highly satisfying for treating infertility. In Traditional Chinese Medicine, “When there is obstruction, there is pain” is the common pathology that is triggered by the different causes of pain. Acupuncture, among the oldest healing practices in the world, is part of traditional Chinese medicine. To relieve pain, acupuncture practitioners stimulate specific points from affected meridians — pathway where Qi (vital energy) travels through. In response to the stimulations to acupuncture points, the body releases endorphins and activates an immune response. The application of acupuncture for pain relief provides a drug-free method to minimize pain. A special analysis of acupuncture data from an earlier NHIS found that pain or musculoskeletal complaints accounted for 7 of the top 10 conditions for which people use acupuncture. Back pain was the most common, followed by joint pain, neck pain, severe headache or migraine, and abdominal pain. 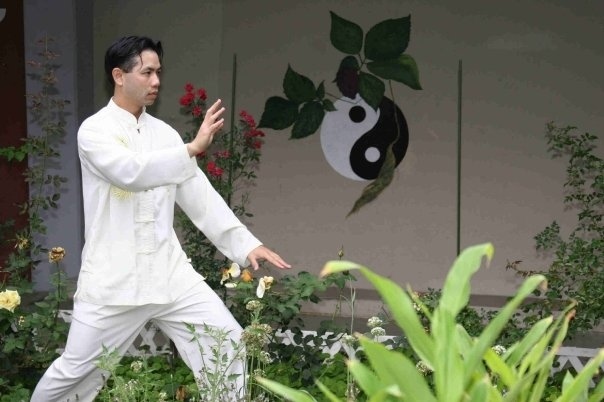 Tai Chi combines meditation and deep breathing techniques with a series of continuous movements, called "forms”. It originated as a martial art, but it is now practiced mainly for its self-healing effects, which includes reducing stress, promoting balance and flexibility, boosting immune systems and even easing pain. Acupuncture for weight loss became popular is 2003 when CNN reported on successful acupuncture weight loss clinics in China. An increase in obesity in China led to the practice of acupuncture for weight loss because Chinese medicinal theory says that overweight people have imbalanced digestive systems. Acupuncture can help you lose weight by strengthening your digestive system. Doing this helps control your appetite and therefore weight loss is achieved. Some theories suggest that acupuncture improves metabolism causing the body to burn calories at a faster rate. In addition to acupuncture, many herbal formulas will be used according to the individual’s body condition. The herbs are there to promote the transformation and transportation functions of the organs. Auricular acupuncture will also be applied to control hunger and thirst and to harmonize the endocrine system. We also provide food therapy to accomplish the goal of weight loss. We evaluate the food log from the patients and we recommend what food should be increased and what food to reduce. This is a stimulation or massage of the acupuncture points using the fingers, thumbs or an instrument like a stick or scrapping board. Acupressure may be used on acupuncture points, which can promote healing or symptoms relief. Specialization of this method are hand, foot and scalp acupuncture. Cupping is a therapy in which a jar is attached to the skin surface to cause local congestion through the negative pressure created by introducing heat in the form of an ignited material. This treatment method is safe and effective and the therapeutic effect is good. It is very often that patients will make a comment about how relaxing cupping treatment is. Also, lots of patients appreciate how the modality can relieve the tension of the body. Acupuncture and Traditional Chinese Medicine (TCM) have been found to be effective at treating the pain and inflammation associated with all types of arthritis. The selection of acupuncture points and herbs depend on the type of arthritis the patient has. In TCM the causes could be wind, cold, damp or damp-heat. Once the root causes are identified, a variety of techniques such as acupuncture, Tui Na (Soft tissue therapeutic work), Gua Sha (scraping technique), Chinese herbs, food/nutritional therapy, and exercises will be applied to achieve therapeutic goals. The primary goal is to restore normal function by helping the body to be in a balanced state. 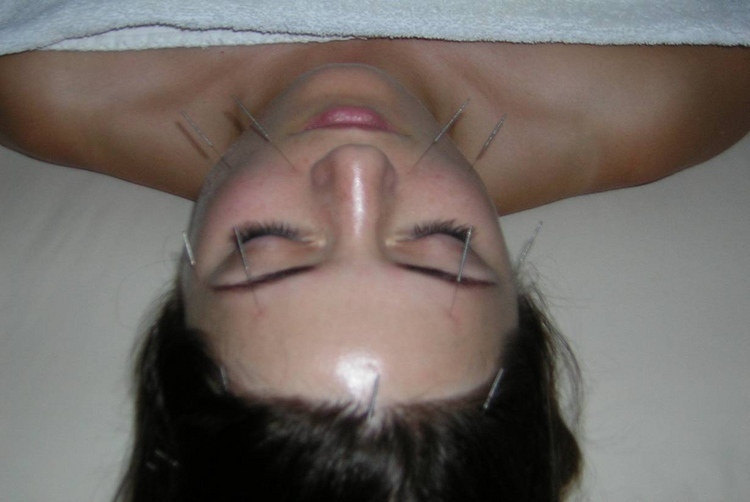 Clinically we have seen many seasonal allergy patients respond exceptionally well with acupuncture treatments. Most patients find acupuncture treatments effective in reducing symptoms like runny nose, sneezing, watery itchy eyes, nasal congestion and low energy. We also prepare individualized herbal formula to help patients to prevent the allergy from coming back. 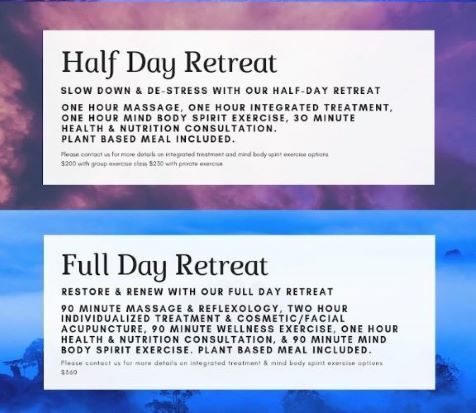 Create a half or full day retreat to relax, unwind and receive abundant healing benefits. Whether it is to slow down and de-stress or to restore and renew! Please call our office 732-696-8282 to schedule your personalized retreat!